On Thursday 9 May 2019 from 19h00 to 22h00. L’EPN des Rancy (249, rue Vendôme, 69003 Lyon) et l'association ALDIL (Association Lyonnaise pour le Développement de l'Informatique Libre) vous proposent des rendez-vous mensuels pour accompagner les utilisateurs de logiciel libre dans la résolution de leur problème informatique. L'objectif de ces ateliers sont l'entraide et dépannages entre utilisateurs de logiciel libres débutants et plus aguerris. L’occasion de voir comment ça marche, de demander un coup de pouce, de faire découvrir une astuce. Rappel: aucune installation de logiciel sous licence ne pourra être faite sans présentation de la licence et de sa preuve d’achat. Par défaut, les intervenants proposeront des logiciels libres mais s’adaptent à d’autres demandes. On Friday 17 May 2019 from 13h30 to 17h30. Mickaël et Johann vous accueillent. 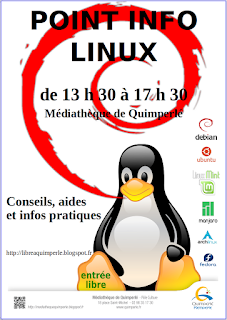 Conseils, aide et infos pratiques GNU/Linux et Logiciels Libres. Pas d’inscription, entrée libre. De 13h30 à 17h30! Pour résoudre vos problèmes, vous êtes le bienvenue! N'hésitez pas à venir avec votre PC si vous voulez une installation de GNU/Linux ou de venir avec votre périphérique récalcitrant (imprimante, scanner...) si possible. On Thursday 6 June 2019 from 19h00 to 22h00. On Friday 7 June 2019 from 13h30 to 17h30. On Friday 19 April 2019 from 13h30 to 17h30. On Thursday 11 April 2019 from 19h00 to 22h00. On Thursday 7 March 2019 from 19h00 to 22h00. On Friday 1 March 2019 from 13h30 to 17h30. On Thursday 24 January 2019 from 19h00 to 22h00. On Friday 11 January 2019 from 13h30 to 17h30. On Thursday 20 December 2018 from 19h00 to 22h00. On Friday 7 December 2018 from 13h30 to 17h30. On Thursday 22 November 2018 from 19h00 to 22h00. On Friday 2 November 2018 from 13h30 to 17h30. On Friday 5 October 2018 from 13h30 to 17h30. On Friday 28 September 2018 from 13h30 to 17h30. On Monday 24 September 2018 from 19h30 to 21h30. On Thursday 7 June 2018 from 14h00 to 18h00. On Thursday 17 May 2018 from 14h00 to 18h00. On Thursday 5 April 2018 from 14h00 to 18h00. On Tuesday 3 April 2018 from 17h00 to 18h00. On Tuesday 27 March 2018 from 17h00 to 18h00. On Tuesday 20 March 2018 from 17h00 to 18h00. On Tuesday 13 March 2018 from 17h00 to 18h00. On Thursday 8 March 2018 from 14h00 to 18h00. On Tuesday 6 March 2018 from 17h00 to 18h00. On Tuesday 27 February 2018 from 17h00 to 18h00. On Tuesday 20 February 2018 from 17h00 to 18h00. On Tuesday 13 February 2018 from 17h00 to 18h00. On Thursday 8 February 2018 from 14h00 to 18h00. On Tuesday 6 February 2018 from 17h00 to 18h00. On Tuesday 30 January 2018 from 17h00 to 18h00. On Tuesday 23 January 2018 from 17h00 to 18h00. On Tuesday 16 January 2018 from 17h00 to 18h00. On Tuesday 9 January 2018 from 17h00 to 18h00. On Thursday 4 January 2018 from 14h00 to 18h00. On Tuesday 2 January 2018 from 17h00 to 18h00. On Tuesday 26 December 2017 from 17h00 to 18h00. On Tuesday 19 December 2017 from 17h00 to 18h00. On Tuesday 12 December 2017 from 17h00 to 18h00. On Tuesday 5 December 2017 from 17h00 to 18h00. On Tuesday 28 November 2017 from 17h00 to 18h00. On Tuesday 21 November 2017 from 17h00 to 18h00. On Tuesday 14 November 2017 from 17h00 to 18h00. On Tuesday 7 November 2017 from 17h00 to 18h00. On Tuesday 31 October 2017 from 17h00 to 18h00. On Saturday 21 October 2017 from 09h30 to 12h00. On Saturday 14 October 2017 from 09h30 to 12h00. On Thursday 5 October 2017 from 14h00 to 18h00. On Saturday 23 September 2017 from 09h30 to 12h00. On Saturday 16 September 2017 from 09h30 to 12h00. On Saturday 9 September 2017 from 09h30 to 12h00. On Saturday 2 September 2017 from 09h30 to 12h00. On Saturday 26 August 2017 from 09h30 to 12h00. On Saturday 19 August 2017 from 09h30 to 12h00. On Saturday 12 August 2017 from 09h30 to 12h00. On Saturday 5 August 2017 from 09h30 to 12h00. On Saturday 29 July 2017 from 09h30 to 12h00. On Saturday 22 July 2017 from 09h30 to 12h00. On Saturday 15 July 2017 from 09h30 to 12h00. On Saturday 8 July 2017 from 09h30 to 12h00. On Saturday 1 July 2017 from 09h30 to 12h00. On Saturday 24 June 2017 from 09h30 to 12h00. On Saturday 17 June 2017 from 09h30 to 12h00. On Saturday 10 June 2017 from 09h30 to 12h00. On Saturday 3 June 2017 from 09h30 to 12h00. On Thursday 4 May 2017 from 14h00 to 18h00. On Thursday 6 April 2017 from 14h00 to 18h00. On Thursday 9 March 2017 from 14h00 to 18h00. On Thursday 16 February 2017 from 14h00 to 18h00. On Thursday 17 October 2013 from 18h00 to 20h00.